Twelve suspects were arrested around Northwest England on 2009-04-08. They were accused of being part of a 'major terrorist plot', as Gordon Brown called it. The police have released the 12 suspects without charge. Some of them were subsequently served with deportation orders and are in the custody of the UK Border Agency. This has all the elements of propaganda: much hyped arrests, no bomb making equipment found at all, followed by all the arrestees released with none being charged. 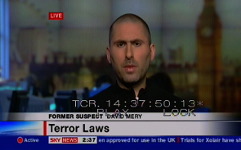 In both the Sky News Today and the Politics Show interviews, the caption introduced me as 'Former Suspect'. Is that more appropriate than say ‘London resident’ or ‘Tried to take the tube’? Such captions have to be short, but this shortening of what is really ‘Formerly considered by the Police to present a suspicious behaviour’ can give the impression of a universality. This would erroneous. Let me know how you react to this label.